Marketing Information: BCC950 Conferencecam features professional HD video with superior speakerphone audio for simple, small-group conferencing. HD 1080p, 30 frames-per-second video with high-quality, full-duplex speakerphone clarity delivers business-grade conferencing. Small groups can collaborate over video from anywhere instead of competing for overbooked conference room systems or huddling around a single PC. 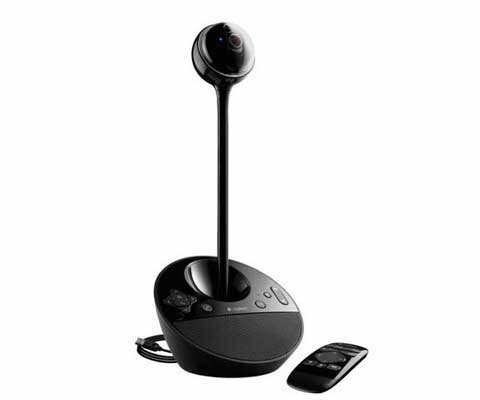 A 78-degree field of view and 180-degree remote-controlled video pan, tilt, zoom ensure each group member is seen. Camera height extender and 8' USB cable allow you to adjust camera height and distance for flattering video angles. Carl Zeiss Optics with Autofocus delivers razor-sharp images from a glass lens and allows detailed documents, whiteboards, or visuals to be shared close-up during calls. Omnidirectional sound and echo cancellation audio make it seem like conversations are happening in the same room. Onboard technology helps ensure quick plug-and-play functionality on both PCs and Macs.